If you’ve been following our blog, you know that today’s inner city youth are in desperate need of a safe place to go after school where they can be tutored, mentored, and nourished. Our after school program has been providing that for twenty years. 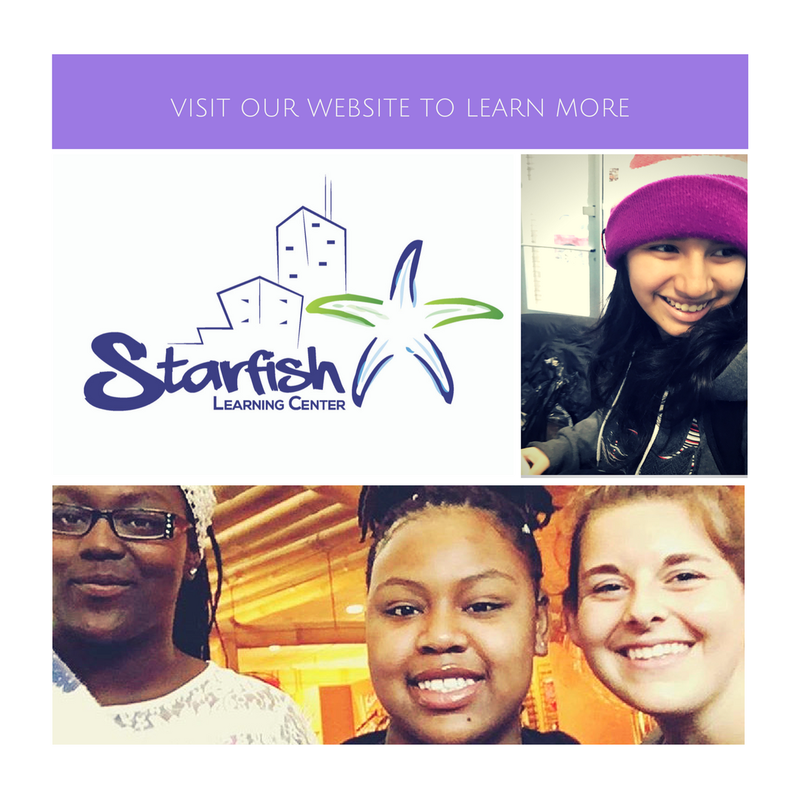 There are several ways to partner with us to make a difference in the lives of at-risk youth: you can spread the word about Starfish by word of mouth and social media, you can volunteer a special skill or tutor during our program, you can donate items that our program can use, or you can give financially to support Starfish. If you read our post A Day in the Life of an At-Risk Youth, you can see what kind of challenges inner-city minority children are up against. Many have parents who are unable to provide childcare after school, thus the kids are free to roam the dangerous streets and mix with the wrong crowd. The absence of a nurturing adult presence during those crucial hours contributes heavily to the future of these kids. Starfish has been consistently providing programming after school for the youth of our neighborhood for twenty years. This service is made possible by the generous donation of individuals like you. Even the small donations add up and provide for our kids. Kids need items like computers, printers, office supplies, and school project supplies to successfully complete their school assignments. Parents can’t always afford these supplies. Many of our students do not even have a computer or printer at home. Without these tools, excelling academically is a serious challenge. Starfish is thankful for our donors who partner with us to make these essentials available to our kids. If you read this article here, you see that inner city youth don’t always have the resources or understanding about nutrition to make food choices that are good for them. Some of them are lucky even to have unhealthy snacks. At Starfish we serve nutritious snacks twice daily during our program. These snacks are made possible by donations from people like you. Starfish doesn’t just provide tutoring to our kids. We want to teach them life skills and hand them the tools to soar in life. Our goal is to teach them to be productive members of society, nurturing wholesome hobbies and skills that keep them focused when the distractions of living in the inner city pull them towards destructive relationships and habits. We have several programs that do just that, but these programs cost money! We need to buy arts and crafts supplies and food and cooking tools. We need volunteers and paid staff to teach and train them. Your financial gift helps us do just that. Several of our kids spend most of their lives in the bubble of their neighborhood. We want them to see that their is a broader world out there, filled with opportunities and healthy relationships. Starfish provides outings to museums, sports and recreational facilities, churches, food pantries and homeless shelters, and much more! Our kids have the chance to explore Chicago as well as other nearby states during our yearly retreat. Your donation helps cover the cost of these events, and broadens the horizon for at-risk youth. Now that you can see specifically how your donation impacts our youth, consider giving to our program today. All donations are tax-deductible. Follow us on social media on Facebook, Instagram, and Twitter for regular updates as to the activities and developments of our program. Great to know how donations can go creative & interesting for kids! Good cause, thumbs up! thank you! We’re committed to helping kids! Great to read this! Thanks for sharing. It is always lovely to find causes like this one and non profits that help young kids thrive and be better. You are helping raise better humans for the world. Thank you! It’s amazing to see what many take for granted. Love the passion you have for this cause! It’s true. It’s all about the kids, though! Great job! this looks like a very good initiative. You are doing a noble deed by helping kids and youth. It’s great to see the various ways a donation can impact these kids. I feel like nutritious snacks and field trips are valuable parts of a school experience that often get overlooked. Children are our future and it’s so important to take care of them. This is a great cause to donate to. This is such an important topic. Not all moms can be home when their children are home from school or in the summer. Great cause. I love when I see people donating to programs and charities that help the youth!!! I was in a program when I was in school called Harlem Children Zone and it changed my life for the better. I will be forever grateful for those people who not only start but support these programs. Yes! I’m so glad you found one that helped you. We need more programs like these!